I've watched The Monster tend net for the Leafs two nights in a row, and he's yet to allow a single goal. He made a save late in the third on a Detroit 2-on-0 that was just sick. I'm loving The Monster. 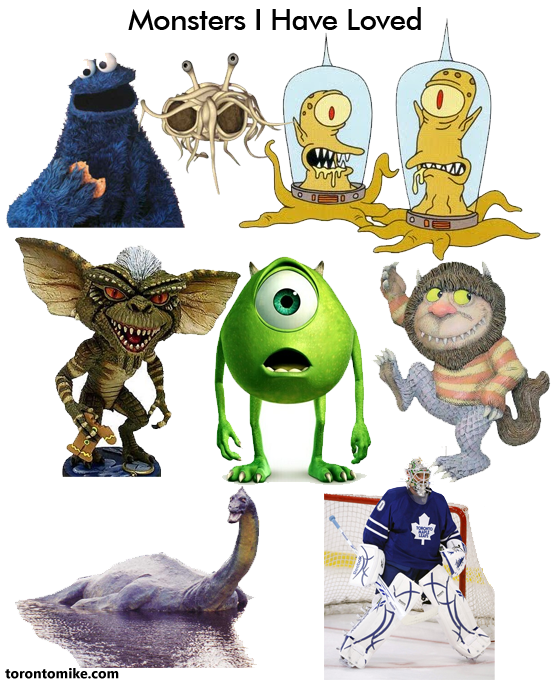 Here are monsters I have loved in my lifetime. I think Joey Macdonald is better. Yes, the Flying Spaghetti Monster is for the geeks and meme freaks out there. Aw, the Sasquatch haz a sad!!! I had you down for a Sully fan. When in doubt, go with the guy named Mike. All Hail the Flying Spaghetti Monster and his delicious pasta tentacles. May you be touched by his noodles of grace today. I don't get the fascination with "Where the Wild Things Are". The film *does* look interesting, but the other day, I read the book, and I didn't quite get it. "The Hockey Sweater" is awesome, especially the NFB film. I think every kid's collection should include both "Where the Wild Things Are" and "The Hockey Sweater". Oh... and "Goodnight Moon", although I noticed they outgrow it by 4... Now I read it to myself every night.